NEW YORK, 14 November 2016 – The international medical humanitarian organisation Médecins Sans Frontières/Doctors Without Borders/ (MSF) welcomes Pfizer’s decision to lower the price of its pneumococcal conjugate vaccine (PCV) for children caught in humanitarian emergencies. 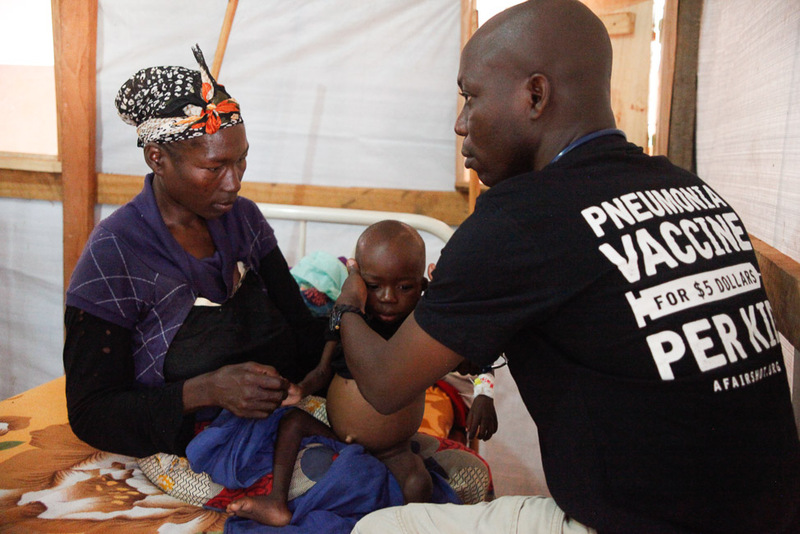 For seven years, MSF urged Pfizer and GSK – the only two manufacturers producing the pneumonia vaccine – to offer the lowest global price to humanitarian organizations, but they refused until September, when GSK announced that it was finally reducing the price of its pneumonia vaccine for humanitarian situations. Now with its announcement on Friday, Pfizer is following GSK’s footsteps. Pneumonia is the leading cause of child mortality worldwide, killing nearly one million children every year. Crisis-affected children, such as those caught up in conflict or in humanitarian emergencies, are particularly susceptible to pneumonia. MSF medical teams often see the deadly effects of pneumonia – a vaccine-preventable disease – in the vulnerable children treated in our health facilities. The price reductions are a significant step forward in protecting vulnerable children who are reached by humanitarian organizations like MSF. 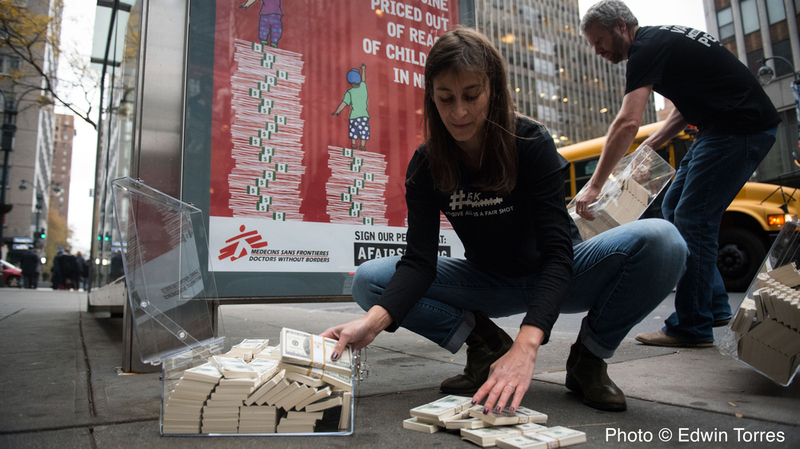 From 2009 to 2014, MSF conducted negotiations with Pfizer and GSK to access a fair and sustainable price for the pneumonia vaccine, before making a notable exception to our policy governing donations from pharmaceutical companies. 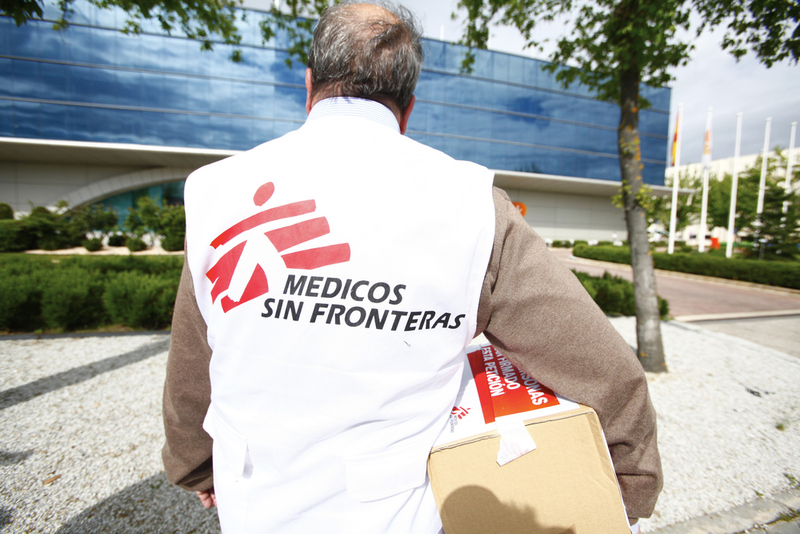 In agreeing to the limited-term donations, both Pfizer and GSK assured MSF that they would work on a longer-term solution to improve affordability. Since then, in absence of such a solution, MSF and other humanitarian organizations struggled to purchase pneumonia vaccines at an affordable price; earlier this year, MSF paid 60 Euros (US$68.10) for one dose of the Pfizer product to vaccinate refugee children in Greece – 20 times more than the lowest price offered by GSK and Pfizer. One third of the world’s countries have not been able to introduce PCV because of its high price. Millions of children living in countries such as Jordan, Thailand, and the Philippines are left out. In 2015, all 193 countries at the World Health Assembly passed a landmark resolution demanding more affordable vaccines and increased transparency of vaccine prices. 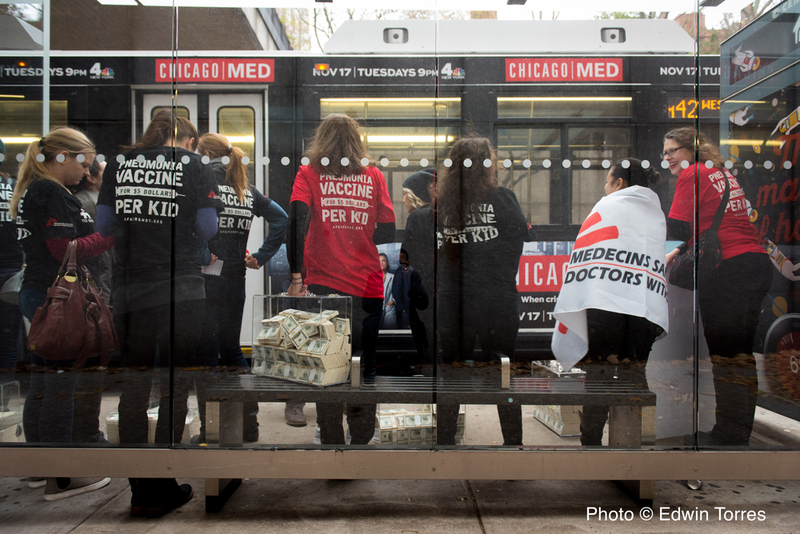 “Both Pfizer and GSK should now redouble efforts to reduce the price of the vaccine for the many developing countries that still can’t afford to protect their children against pneumonia,” said Dr. Liu. It is now 68 times more expensive to vaccinate a child than in 2001, according to a 2015 MSF report, The Right Shot: Bringing down Barriers to Affordable and Adapted Vaccines. The pneumonia vaccine accounts for almost half the price of the entire vaccination package for a child in the poorest countries. 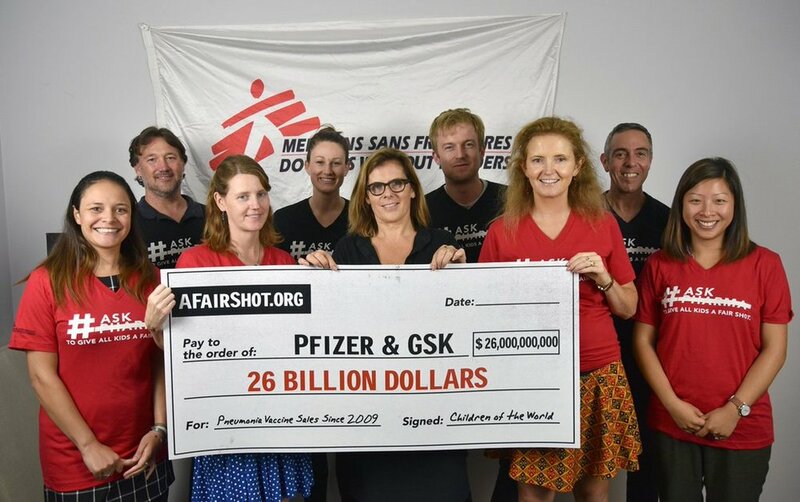 After years of unfruitful negotiations, in 2015, MSF launched A Fair Shot, a public campaign asking Pfizer and GSK – the only two manufacturers of the pneumonia vaccine - to reduce the price of the vaccine. 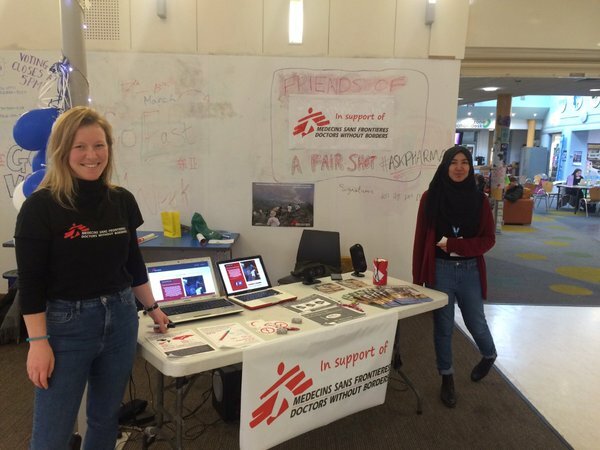 Earlier this year, on April 27th, MSF delivered the names of more than 416,000 people from 170 countries who signed a petition asking Pfizer and GSK to reduce the price of the pneumonia vaccine to US$5 per child (for all three doses) for crisis-affected populations and for all developing countries. . In September, GSK announced that it was finally reducing the price of its pneumonia vaccine for humanitarian situations. Now with its announcement on Friday, Pfizer is following GSK’s footsteps. Almost a year ago to the day, we were outside your office in New York City piling fake cash in front of your doorstep. Six months ago, we returned to lay 2,500 flowers into a crib — all this to illustrate that the life-saving pneumonia vaccine Pfizer makes isn’t reaching children in need. I know we may not have started off on the right foot, so let me introduce myself: I’m Mary Jo, and I’ve worked as a nurse with Doctors Without Borders for 17 years. 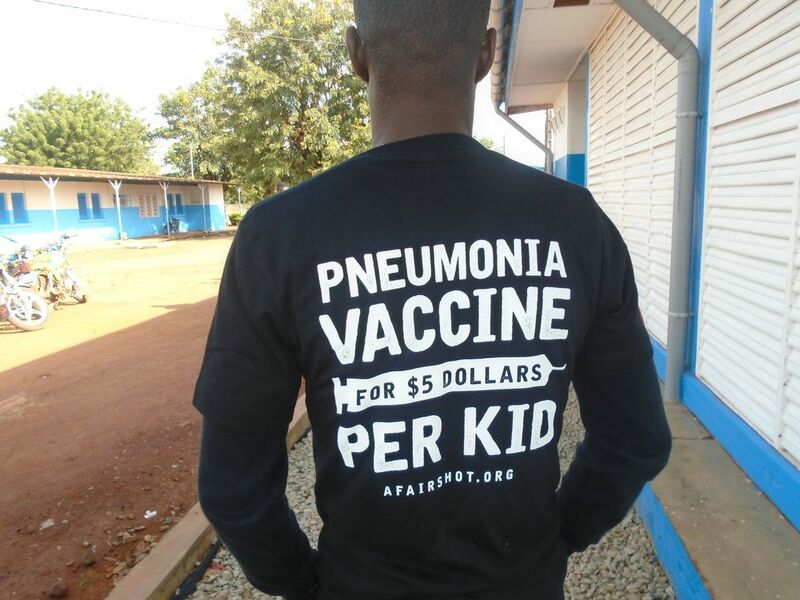 By now you may have heard what our campaign, A Fair Shot, is asking of you: pneumonia vaccine for $5/child for all developing countries and humanitarian organizations. I need this possibility to become a reality, because the reality we live in now — where nearly a million kids die every year from this preventable disease — is heartbreaking. Let me tell you about Mohamed, a six-year-old boy I met on my most recent mission to Nigeria. He was sitting on the floor with his younger brother when I arrived at the clinic. They both looked very thin and had terrible, painful-looking ulcers on their lips. Mohamed was pretty much non-responsive. At the same time, though, he was huffing and trying desperately to breathe. He had a respiratory rate of 60, about three times higher than what it should be for a kid his age — meaning his lungs were working extra hard to get the amount of oxygen he needed. I picked him up immediately. His breathing rate was a clear sign of pneumonia. Later we confirmed that Mohamed had malaria, measles, pneumonia — the trifecta of childhood killers — and malnutrition, too. We found an isolation bed for him and placed an IV in to administer the fluids and medicine he needed. What struck me most about Mohamed was his seriousness. Even though I could tell he was in a lot of pain, and he didn’t have an appetite to eat or drink water, he was committed to his own autonomy. He wanted to hold the cup in his own hands, because it’s not normal to need someone else to have to feed you when you’re six years old. He was so weak, but he was committed to holding on. Mohamed went home with his mom and brother that night. 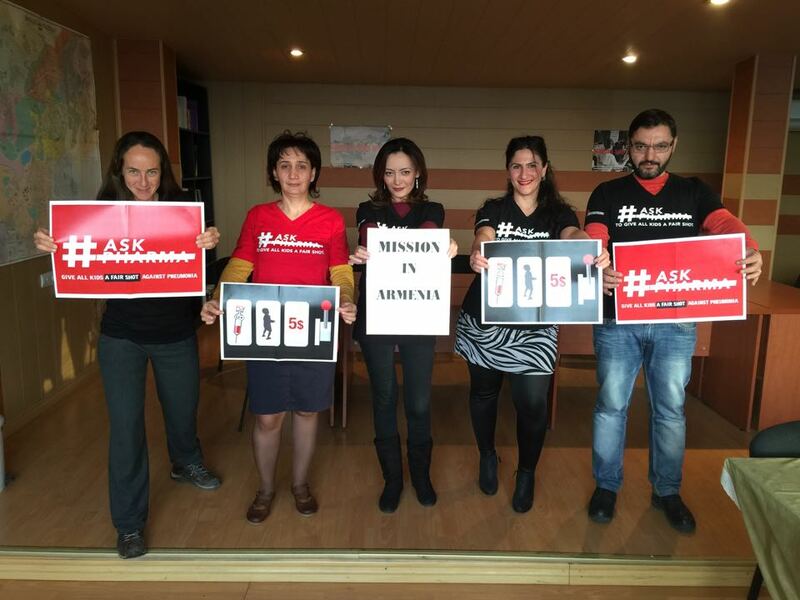 The next day, I went to another MSF clinic, closer to his home, and looked for him. When I walked into the pediatrics ward, I saw him just as when I met him the day before, sitting on the floor with his brother. But this time, he was lively. He was smiling. The turnaround was incredible. Mohamed was lucky he came into our clinic when he did, and we were lucky the antibiotics worked against his pneumonia. This isn’t always the case. I think about what kids like Mohamed experience. Many of the kids we meet go through so much in life at such a young age — war, conflict, the constant running, and horrible poverty. We can’t prevent these things from happening. But the diseases? Those we can prevent. If we can at least protect kids with vaccination, then they have a fighting chance of surviving the rest of this stuff. Mohamed’s pneumonia could’ve been prevented if your vaccine was available. Even when countries, like Nigeria, have introduced the pneumonia vaccine into the regular immunization schedules, sometimes conflict or natural disasters will disrupt routine health programs. That’s when humanitarian organizations can help provide some relief until situations stabilize. That’s why it’s important to lower the price of the pneumonia vaccine for countries who don’t receive donor-funded vaccines and humanitarian organizations. We know that in order for this to become a reality, the desire for change has to come from within Pfizer, too. Will you stand in solidarity with kids like Mohamed? It may not be easy, but if this resonates with you, please help spread the word by sharing this with a co-worker. Crowds draw into the local schools and churches of little villages, nestled against lush forests. Mothers wait with their children, lined up on wooden benches. Everyone is quiet – surprisingly enough for a long line of people made up mostly of the under-6 years-old crowd. But the closer the children get to the nurses, the more their curiosity morphs into terror. Open the mouth for the oral polio vaccine. Prepare one leg for the pentavalent. The other one for the pneumonia vaccine. Then they’re done, and the children are left open-eyed, cheeks wet from tears. Amongst the screams, some mothers laugh. It’s hard to see your kids cry, but they know it’s better to struggle with a healthy child trying to escape the needle, than to have to carry a limp, feverish child for a few hours walk to the nearest affordable clinic instead. This is a reality that many parents deal with in Central African Republic (CAR). Health centers are few and far between, poorly stocked and staffed, and their limited services are unaffordable for most. In CAR even more than in the rest of the world, one had better not fall sick. Even before the latest crisis, vaccination coverage was already very low at barely an estimated 40%, which meant high childhood mortality due to easily preventable diseases. The 2013-2014 conflict that killed thousands and forced up to a quarter of the entire population to flee their homes further disrupted an already barely functioning health system. All state functions ground to a halt, including routine vaccination programs, making an already bad situation even more dire. In Bangassou, the main city of Mbomou province, respiratory infections are the third cause of mortality among children, after malaria and neonatal deaths. But during the upcoming dry season when malaria cases wane, respiratory illnesses jump to the top as the deadliest disease for the youngest. To boost children’s protection, MSF organized catch-up vaccination campaigns in most of its 17 projects across the country for the under-six-year olds who, for the most part, did not get any routine shots. 20,000 children in Bangassou, and over 100,000 across the country received vaccination against nine potentially deadly diseases2, including pneumonia. 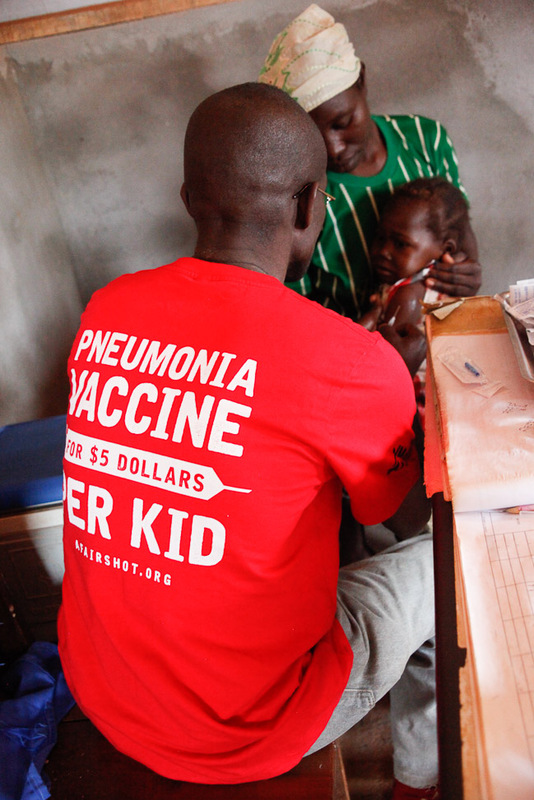 Around the world, pneumonia is the number one killer of children under age five. It can be a parent’s worst nightmare, which Blanche Foutcho, a mother from CAR, knows all too well. “My 9-month old son, Jésuré, was sick two months ago. He started breathing strangely, very quickly. We were very worried, and we walked 2 hours to reach Yongofongo where it’s free. From there, we were transferred to Bangassou, and Jésuré was hospitalized for a week. Now he’s doing better, but he still gasps for air when he cries,” she says. When a country's health facilities collapse due to conflict, humanitarian organizations can provide some relief by responding to healthcare needs. We can help parents, like Blanche, avoid this nightmare by providing access to the pneumonia vaccine. But vaccinating kids living in crisis-affected countries can be challenging when the price of the pneumonia vaccine is too high for governments and humanitarian organizations to afford. So who will help to protect the millions of kids caught in conflict? Let's not let our children go unprotected. We need to give all kids A Fair Shot. We need Pfizer & GSK to lower the price of the pneumonia vaccine to $5/child for all developing countries and all humanitarian organizations. 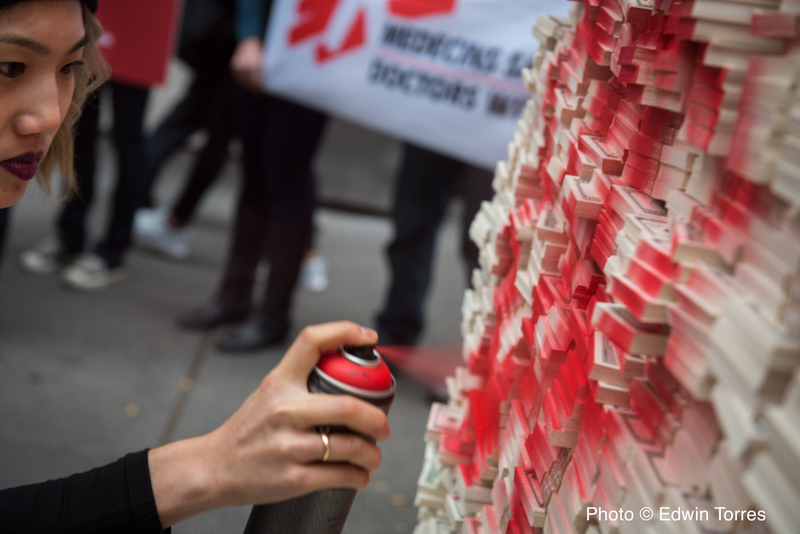 NEW YORK/ LONDON, 20 September 2016 – The international medical humanitarian organisation Médecins Sans Frontières/Doctors Without Borders/ (MSF) welcomes the decision by GlaxoSmithKline (GSK) to lower the price of its pneumococcal conjugate vaccine (PCV) for humanitarian organisations that serve refugee and crisis-affected children. For seven years, MSF has been in discussions with GSK and Pfizer – the only two manufacturers producing the pneumonia vaccine – for access to a more affordable price. GSK’s price reduction is a significant step forward in protecting vulnerable children who are reached by humanitarian organisations like MSF. MSF now hopes that Pfizer will match GSK’s offer, and that both companies will additionally reduce the price of the vaccine for governments of developing countries which still can’t afford to add the PCV vaccine to their standard childhood immunisation package. 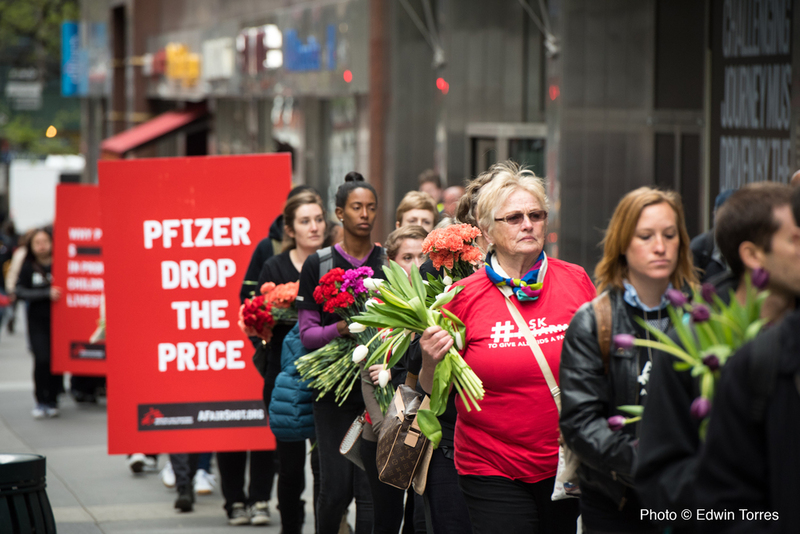 “Pfizer should now match GSK’s move and help build a broader solution for the humanitarian community by also offering the lowest global price,” says Liu. 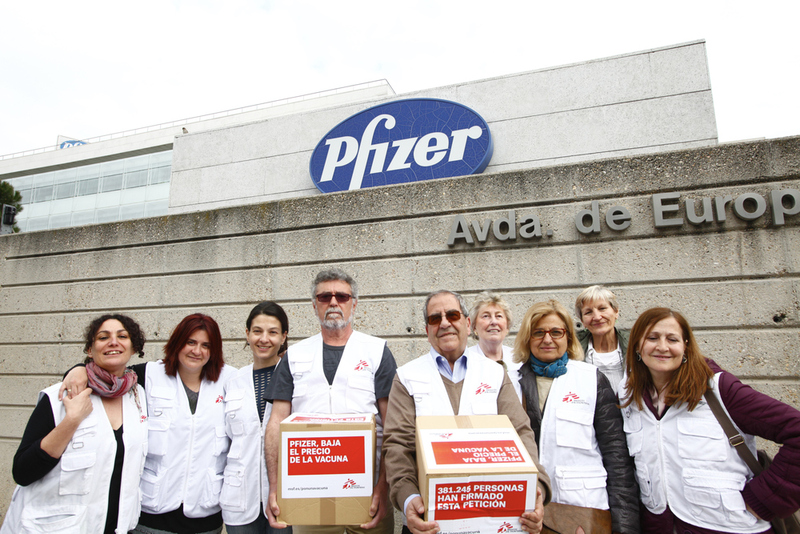 Instead of lowering the price for the humanitarian community, Pfizer has offered only a donation programme. 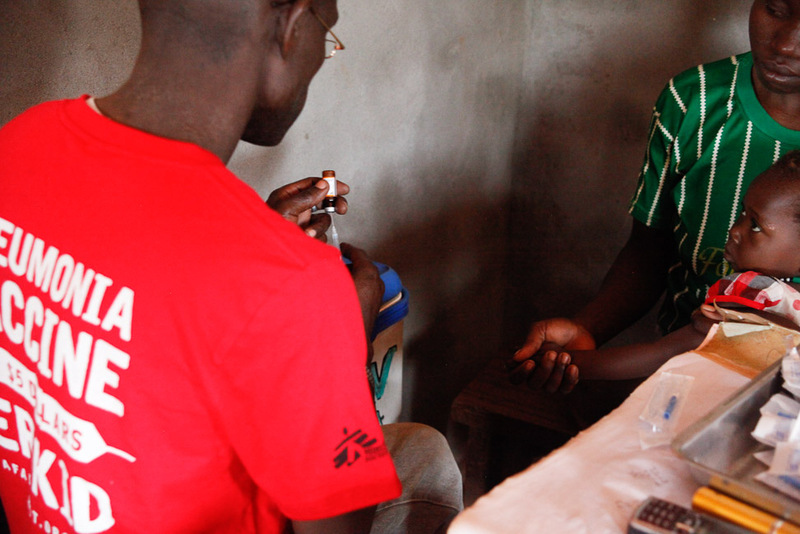 MSF prefers to have access to affordable and sustainably-priced vaccines so that the health of vulnerable children does not rely on the voluntary goodwill of companies. "There's this child... he's breathing so weird..."
You've done several missions with MSF as a nurse. Looking back, do you remember encountering any kids with pneumonia? In our work, we see so many children with respiratory infections. After several missions with MSF, it's very common to see - kids either come in because of diarrhea, malaria, pneumonia, or some kind of combination of these three. When I think about it, I actually remember the first baby I ever saw with pneumonia was on my first mission with MSF. We were in Colombia setting up mobile clinics in remote areas, which would take around 6 to 8 hours by canoe to reach. Our national staff - doctors and nurses - would do the medical consultations, and the expatriate staff were there to help. I was there to triage, so I assessed the patients as they came in and give a quick diagnosis of each case. I went to the doctor and said, "There's this child... he's breathing so weird." And the doctor said to bring him to her immediately. I told the mother to come, and I stayed to observe, because I saw how worried the doctor was. The doctor had worked her whole career in this context - helping underserved people - and to see her so concerned was alarming. It took me awhile before I understood that the baby had pneumonia. And I really felt bad afterwards, because I didn't think the baby was in as bad of a condition as he was. I told you, I never saw any child come in with that kind of sickness before. 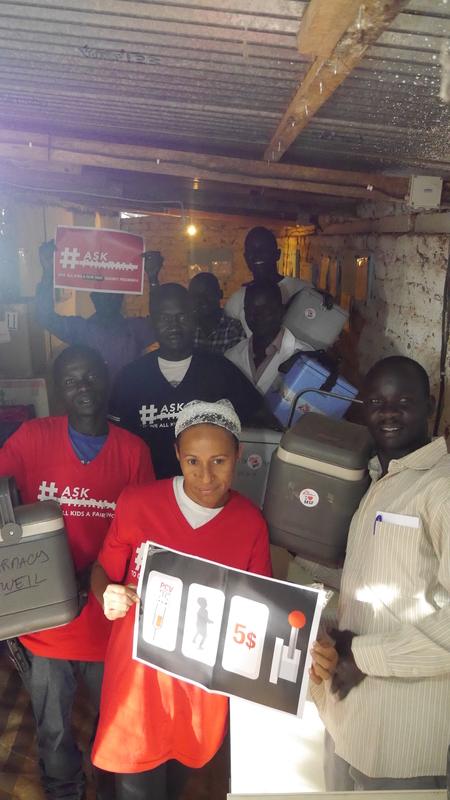 What's the biggest difference between a pediatric ward in Italy and one in an MSF setting? There's no crying in the pediatric wards in MSF settings. There is no sound. Maybe just the normal sounds of a clinic, like the nurse walking or maybe the sound of a mother. It is not a pediatric ward as you imagine. When kids are very sick, they don't really cry. It's crazy how, depending on where you're born, your chances of survival can vary so greatly. What happened to the child in Colombia? Yes, we were very lucky, because he must have been very sick for at least a week before he came into our clinic, but the family wasn't able to seek healthcare sooner. I say this completely without judgment, because you have to understand the setting. It's not easy to reach healthcare in these areas. Like I said, it takes hours to travel by canoe and car to reach the nearest hospital. And you need money to pay for the transportation, to pay for the canoe, then the car, and journey back. It's not easy. THANKS FOR TAKING ACTION WITH US! The pneumonia vaccine is available in the Philippines, but the price is still too expensive ($45/child) to protect all Filipino kids in the long term. 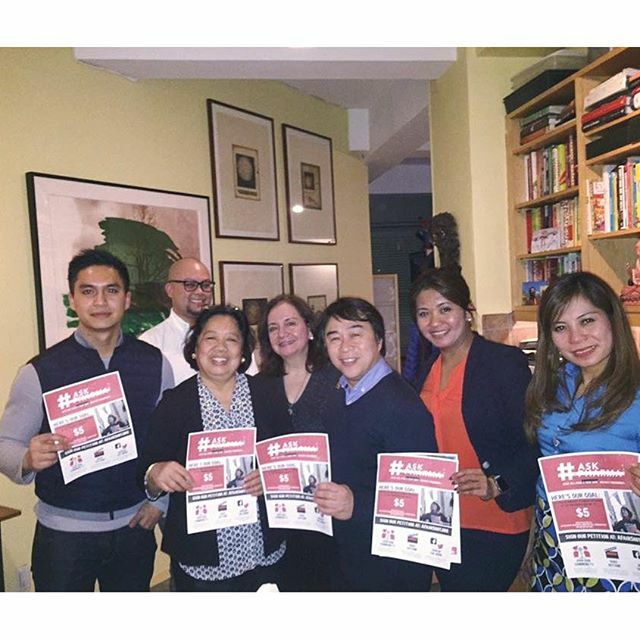 We believe in the creative potential of the Filipino diaspora to solve big problems. Let's take action together! 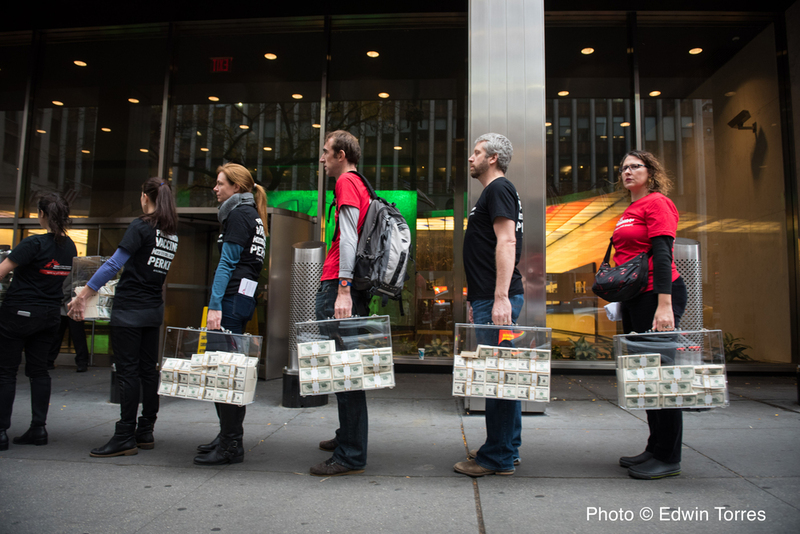 Thanks to NextDayBetter for joining forces with us to demand Pfizer and GSK lower the price of the pneumonia vaccine. As a thought leader in global public health, Don Eliseo Lucero-Prisno III works to solve health inequities and improve the lives of the poor in the Philippines. 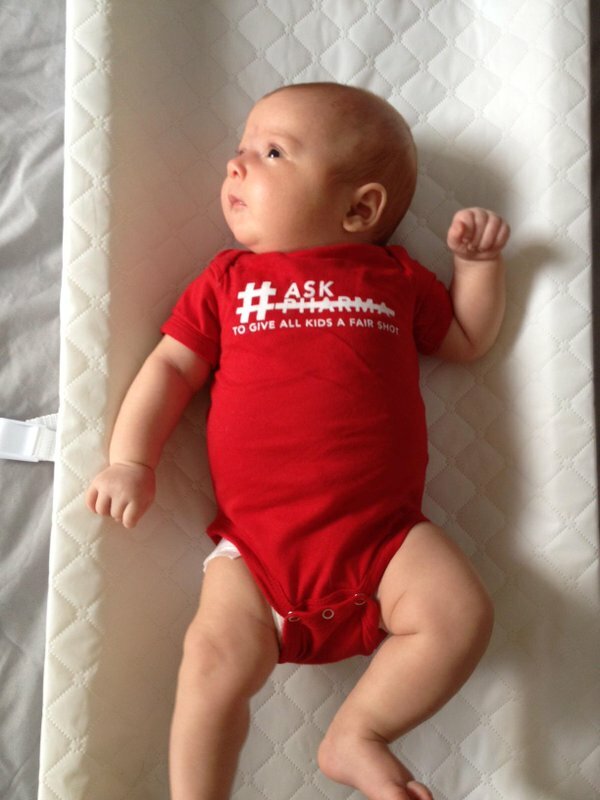 Join him in asking pharma companies to drop the pneumonia vaccine price to $5/child. Let’s give all kids in the Philippines, regardless of their background, a fair shot against pneumonia. Nurse + Hip Hop Artist Haniely Pableo believes that all children in the Philippines should have a fair shot against pneumonia. 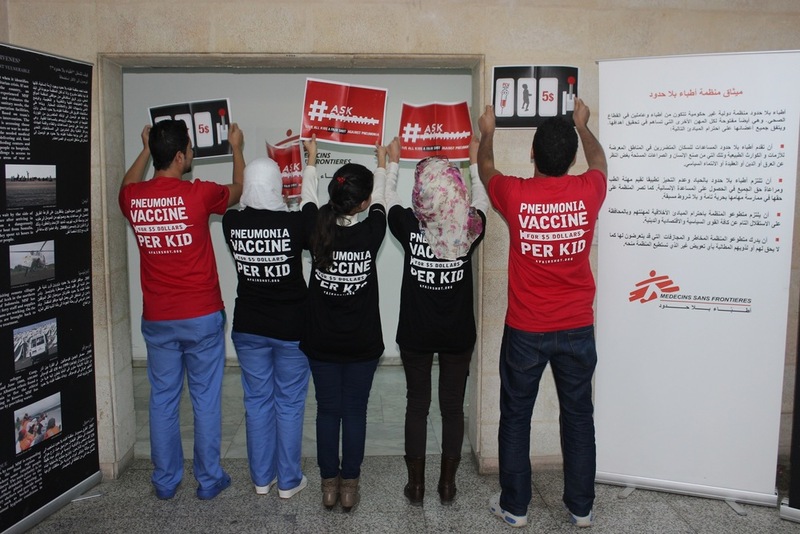 Bangui, Amsterdam, Barcelona, Brussels, Geneva, Paris, 13 January 2016 – Médecins Sans Frontières (MSF) has launched a vaccination campaign of unprecedented scale targeting some 220,000 Central African children. Initiated last July in cooperation with the Ministry of Health in the north of the country, the campaign has now moved to sub-préfecture Berberati in southwest CAR and will gradually be extended to all 13 sub-prefectures where MSF runs medical programmes. It is set for completion by the end of 2016. Diphtheria, tetanos, whooping cough, polio, haemophilus influenzae type B, hepatitis B, pneumococcus, yellow fever and measles. Don’t be fooled by what Pharma says. 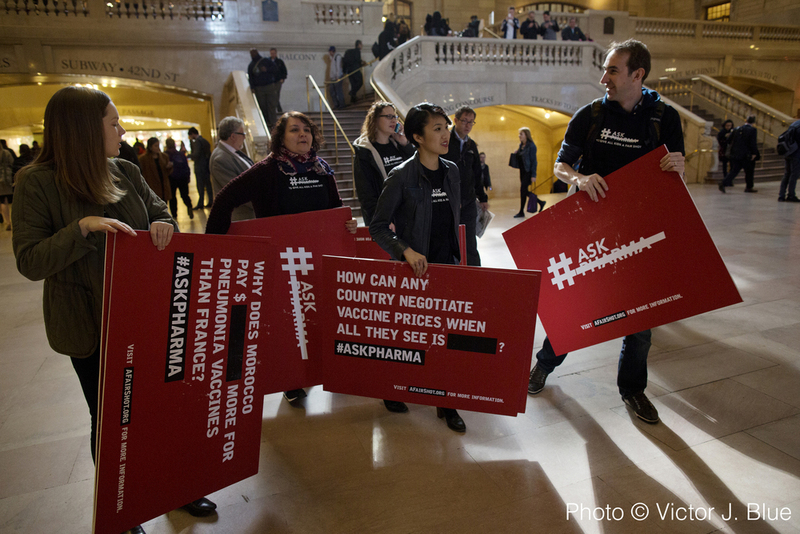 The more you learn about vaccine pricing, the more you’ll want to #AskPharma for answers. Lying in a hospital bed, Nyamal is fighting for her life. Every breath for her is laborious and difficult. Once upon a time there were two kings of the pneumonia vaccine world, Pfizer and GSK.